B is for Bubbles. Bubbles, bubbles, bubbles. This bar was indeed a bubble maker. 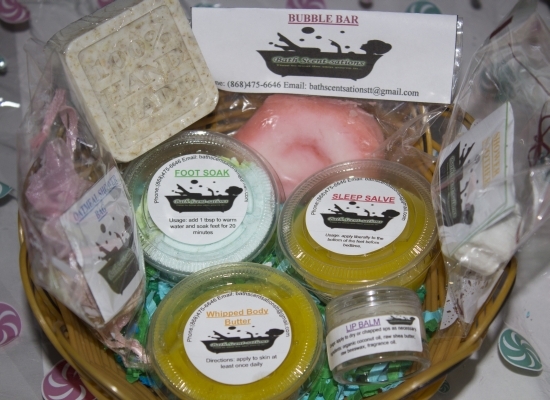 I was unable to test out in a bath tub but I did use the product within a foot bath and the bubble production was amazing. You can simply break off a piece of the bar or use the entire bar for a bathtub. 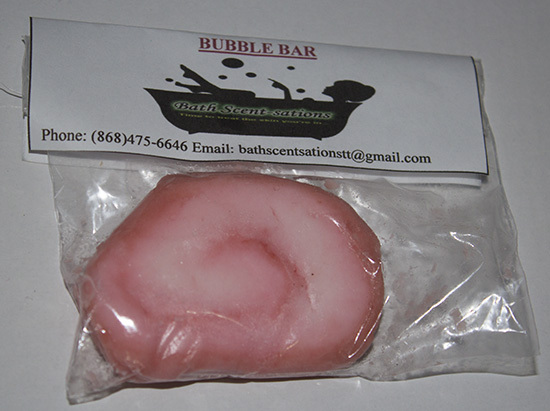 The product itself feels moisturizing but it is soft to the touch so can break apart quite easily. Store in a cool place to avoid it melting and disintegrating. This little product is quite amazing. The scent is quite intense but smells wonderful in your bath with calming scents of eucalyptus. The bag contains soap bits which provide for a great lather. 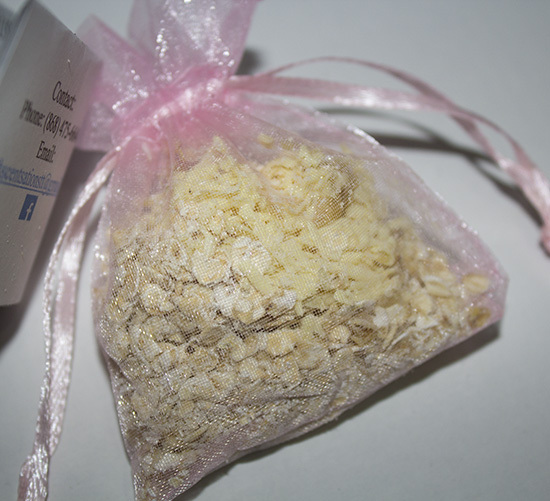 The other main ingredient is oats with provides for good exfoliation in addition to the texture of the bag itself. I was able to use this shower bag multiple times (about 4) before the soap particles were dissolved. Store in a cool dry place after use to ensure maximum usage. This was one of my favorite products out of the set. The scents of sweet orange and cinnamon reminded me of a homemade recipe my grandmother use to make. The texture was a bit runny when received due to our hot weather but I was able to place it in the fridge for about 1 hour and it firmed up to a buttery consistency. The product glides smoothly onto the skin and absorbs well but play around with the amount to be used or your skin can feel too greasy. You only need a little to get the moisturizing effect. The packaging was a little soft so you should store upright. However, based on new pictures seen on the seller's Facebook page, she has upgraded the packaging to a white sturdy container. Instructions state to apply to the bottom of the feet before bedtime and this causes the product to stimulate the sleep receptors perhaps. I have no problems with sleep so I couldn't estimate whether or not it really activates sleep. However the product itself smells delightful. You get the hints of the sweet orange oil. 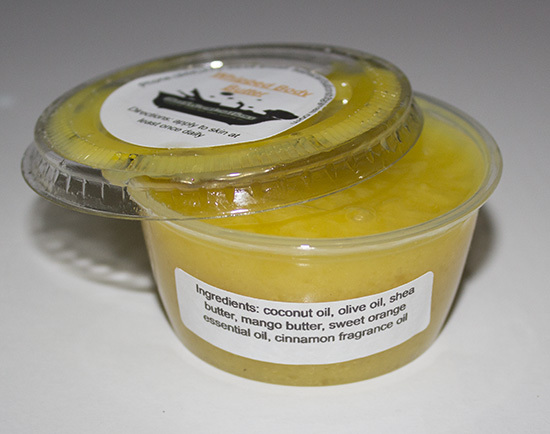 The texture of the salve is softer than the body butter and melts easily into the skin. Don't apply too much or it can be too sticky.